Jackson Rathbone, one of the stars of the blockbuster Twilight series, is raising adrenal cancer awareness in young Hollywood with his band, 100 Monkeys. The star lost his friend and fellow musician, Spencer Bell, to adrenal cancer in 2006. Bell was just 20-years-old when he died from the disease. The Spencer Bell Legacy Concert is set for April 24, 2010 in Dallas, TX. Rathbone recently directed a music video (below) featuring one of Bell's songs, Beautiful, More So. The concert will benefit adrenal cancer research. Jackson Rathbone will soon prove that he is aware of health issues. In April 2010, the Jasper Hale of "Twilight Saga" film series and his band 100 Monkeys will fly to Texas to host a concert which aims to raise awareness of adrenal cancer, the Spencer Bell Legacy concert. At the upcoming gig, Jackson and 100 Monkeys are going to pay tribute to musician Spencer Bell, who passed away in December 2006 after suffering adrenal cancer. They will join The Stevedores, Drew and the Medicinal Pen, and Tin Tin Can to participate at the concert that will include playing several songs from Spencer's albums. Jackson Rathbone himself was last seen reprising his Jasper Hale character in "The Twilight Saga's New Moon". He can next be seen starring as Sokka in "The Last Airbender" before hitting U.S. theaters with "The Twilight Saga's Eclipse". 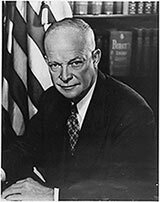 President Eisenhower experienced an acute heart attack in September 1955 and died of ischemic cardiomyopathy 14 years later. The autopsy revealed, unexpectedly, a 1.5-cm pheochromocytoma in the left adrenal gland. In view of these hitherto unreported findings, the investigators analyzed the blood pressure pattern of the president throughout his life. Although hypertension was documented on and off from 1930 until his death, it is unknown whether the pheochromocytoma was present during his presidency. During the later part of President Eisenhower's life, excessive systolic and diastolic blood pressure spikes were documented, although he concomitantly had severe ischemic cardiomyopathy. In conclusion, most likely, the pheochromocytoma was the underlying cause of this erratic blood pressure pattern and may have worsened the course of the president's ischemic cardiomyopathy. Am J Cardiol. 2007 May 1;99(9):1325-9. The president and the pheochromocytoma. Messerli FH, Loughlin KR, Messerli AW, Welch WR. 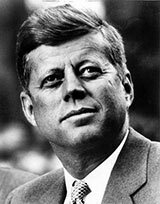 President Kennedy's Addison's disease, which came to light only after his election in 1960, was most likely caused by a rare autoimmune disease, according to a Navy doctor who reviewed Kennedy's medical records. The disease, autoimmune polyendocrine syndrome type 2, or APS 2, also caused Kennedy's hypothyroidism, according to a report published Tuesday in the Annals of Internal Medicine. Hard though it is to believe these days -- when a celebrity's smallest sneeze is analyzed -- Kennedy's family and advisors were able to keep his medical history virtually secret. Kennedy, at 43 the youngest president ever elected, was portrayed as healthy and vibrant. In reality, he suffered various problems controlled by a daily regimen of steroids and other drugs. Addison's disease is characterized by the withering of the adrenal glands, which produce adrenaline and other hormones. Symptoms include fatigue, dizziness, muscle weakness, weight loss, difficulty standing up, nausea, sweating, and changes in mood and personality. Tuberculosis accounts for about 20% of cases; the rest are autoimmune in origin. During the 1960 campaign, Kennedy's opponents said he had Addison's. His physicians released a cleverly worded statement saying that he did not have Addison's disease caused by tuberculosis, and the matter was dropped. Kennedy collapsed twice because of the disease: once at the end of a parade during an election campaign and once on a congressional visit to Britain. Kennedy was diagnosed with Addison's in the 1940s. In 1955 he was diagnosed with hypothyroidism, an insufficient output of thyroid hormones. Symptoms can include many of those associated with Addison's, as well as paleness, intolerance to cold, depression and a low heart rate. 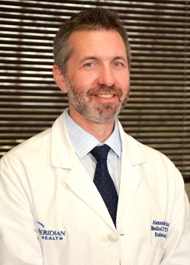 Dr. Lee R. Mandel, a Navy Medical Corps endocrinologist in Chesapeake, Va., was allowed to review Kennedy's medical records at the John F. Kennedy Presidential Library & Museum last year, and he also corresponded with many of Kennedy's physicians. Mandel concluded that the hypothyroidism and Addison's resulted from APS 2. Mandel found that Kennedy took a host of drugs and other remedies during his presidency: 500 milligrams of vitamin C twice daily; 10 milligrams of hydrocortisone daily; 2.5 milligrams of prednisone twice daily; 10 milligrams of methyltestosterone daily; 25 micrograms of liothyronine twice daily; 0.1 milligrams fludrocortisone daily; and diphenoxylate hydrochloride and atropine sulfate, two tablets as needed. Liothyronine is a synthetic thyroid hormone. Diphenoxylate/atropine, commonly known as Lomotil, is used to treat diarrhea. The testosterone was administered to combat the weight loss and gonadal atrophy associated with the steroids he was taking. One characteristic of autoimmune diseases such as APS 2 is that close relatives often are affected as well. Kennedy's younger sister Eunice had Addison's, and John F. Kennedy Jr., his son, suffered from Graves' disease, in which the thyroid is overactive. "Los Angeles Times" February 25, 2007 | Claire Noland, Times Staff Writer wrote the following article titled "John F. Kennedy's Addison's disease was probably caused by rare autoimmune disease"
"President Kennedy's Addison's disease, which came to light only after his election in 1960, was most likely caused by a rare autoimmune disease, according to a Navy doctor who reviewed Kennedy's medical records. The disease, autoimmune polyendocrine syndrome type 2, or APS 2, also caused Kennedy's hypothyroidism, according to a report published Tuesday in the Annals of Internal Medicine. Hard though it is to believe these days -- when a celebrity's smallest sneeze is analyzed -- Kennedy's family and advisors were able to keep his medical history virtually secret." Immortalized as a domineering king, notorious philanderer, and the unlikely benefactor of a new church, Henry VIII became a legend during his own reign. He became England’s most infamous ruler. 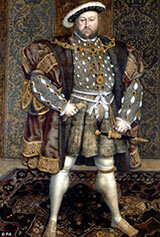 After 35 years in power, Henry VIII was a bloated, hideously obese, black-humoured old man, rarely seen in public. Historian Robert Hutchinson has theorized that he has had Cushing’s Syndrome. The Last Days of Henry VIII: Conspiracies, Treason and Heresy at the Court of the Dying Tyrant by Robert Hutchinson, William Morrow (September 20, 2005).